Sometimes I recall dates according to what zhet (hustle) was ‘the in zhet in Zimbabwe at that time.’ You remember ngoda (diamond rush), burning and the associated BACCOSSI, charcoal irons, zvihuta (quail birds), MMM..? Is bitcoin the same as these passing fads (some of them were nothing but scams really)? My answer to that is yes and no. Before giving the opposing sides of my confused answer above, I should start by describing some of the zhets that Zimbabwe has seen over the years. Excuse me if the article becomes too long, I am not sure how this article will pan out but I do hope this article will give you context to make your own decision about bitcoin – Zimbabwean context. The diamond rush which started in September 2006 saw more than 10 000 people descend upon Marange to scrounge for the precious stones. The fields were almost a lawless autonomy where the law of the jungle prevailed. People made a lot of money but some suffered violence or lost their lives for having announced they had found a stone. Most though lost time, having never found what they were looking for but still these were luckier than those that were conned out of their money having been sold fake diamonds and some were conned out of the diamond they had found. This episode ended with a military intervention (they didn’t start in November 2017 it seems). The criminals around Marange were targeted for sure. All of them even those who were just honest citizens trying to make a living were expelled from the area and the military stayed and some companies came to start mining and years later we were told $15 billion went missing and nothing was realised by the state out of the mining in Marange. BACCOSSI originally meant Basic Commodities Supply Side Intervention. It was a programme introduced in 2007 by Gideon Gono the former Reserve Bank of Zimbabwe governor. It was one of those ill conceived government programmes of the time that sought to alleviate poverty by introducing distortions in the market. Anyway, on the streets, BACCOSSI meant stuff that’s being sold at a give away. In the streets in 2008 mostly airtime was being sold at ridiculous give away prices. Why? People selling the airtime (and other stuff on BACCOSSI) wanted to mop up cash (Zimbabwean dollars) so they could buy foreign currency (mostly USD) on the very same streets. What would they do after getting the USD? Easy, they would burn it! No, stupid they didn’t burn it that way!!! They sold it to people who had large sums of Zimbabwean dollars in their bank accounts which they were willing to give in abundance in exchange for one American dollar. People on the streets made a living out of manipulating this differential in the value of the different currencies. Yes history has repeated itself. Another term that was coined in this era was ‘high rate.’ It was exactly what you think it was. There were multiple rates for currency conversions on the streets and each of the money changers claimed they had the ‘certified high rate’ for the day. The rate indeed kept getting higher (by rate I mean the Zim dollar you could get for the USD). It went to unsustainable levels and of course more and more people were on the streets changing money. They would change among themselves too. Little did they know that with every transaction the Zimbabwean economy was dying more. Nine lives of a cat it may have but it was losing them fast. 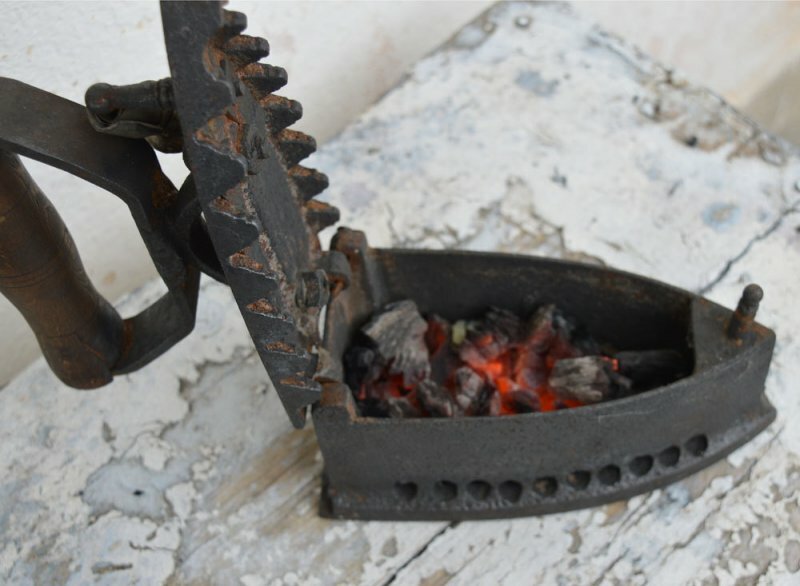 In 2011 word spread that old charcoal irons (like one in the picture) were in demand somewhere outside of the country and there were buyers ready to buy at crazy amounts (we were now using USD). The initial price was $600 but it kept rising to above $5 000 for each iron. There was a catch: there was a specific type of charcoal iron that was sought. It had to have been made in Germany or Italy and it had to magnetically attract a razor blade to its base. The country went on a frenzy. Almost every other person was looking for an iron. Rural homes were raided ana gogo vakasara vasina chekuainisa. Some people seemed to make money but to most it was fool’s gold. Some clever person or people invented the demand for these irons and started buying them. The story spread and an economy around charcoal irons was created. People would buy from other people so they could sell to the next middle man they knew had a higher price. The clever inventors then claimed that they were now buying at an even higher price because the ‘appropriate’ irons were now scarce. At the same time they were releasing the irons they had already bought through the back door and selling them at a price lower than the higher price they had invented but definitely higher than what they had spent on them. Remember some middle men were buying irons at $2 500. Little did they know they were buying the irons from the very same people who had promised to buy them at $5 000. The whole razor blade thing was deliberate to create scarcity in the market and to symbolise inherent value in the charcoal irons. Clever people! The middle men who were left with the irons were the broke losers at the end. To be honest, my theory is probably very wrong (most likely wrong actually). There could have been a real demand for those irons but prices got inflated along the chain until it was not sensible for the people who needed the irons. The quail bird craze was almost exactly like the irons above except that the story was that quails were the healthiest food ever. Demand soared. Every other family constructed a fowl run and kept zvihuta. I bet (no I don’t really) there was some clever person who had more zvihuta than anyone else because they had created the demand. Of course quails have nutritional value but the demand created for them was probably not consistent with the actual value of the birds. BUT, such is the nature of free markets. In Zimbabwe, the streets probably exhibit the truest form of free markets than the formal economy. Supply and demand rule the black market (the politically correct term is parallel market). This was the ponzi scheme that got people from all over the world fooled. Like all pyramids, the first people to jump on the train actually made money. However as more people joined madhiri akabva afa (the deals went south). MMM is well documented so let me end here. First let’s be clear, bitcoin has no intrinsic value at all. However the technology on which it is built, the blockchain could be the game changer in everything from transactions to registry solutions to the Internet of Things (IoT). Maybe I will get to write about that some other time. So yes the currency called bitcoin has no intrinsic value but it shares that characteristic with all currency on this planet. Since the USA declared that their dollar was no longer backed by gold decades ago the whole world started to use fiat currencies. These currencies are backed by trust that the issuing government will be there forever and that it ‘pays it’s debts’ yes like a Lannister. Some obviously advocate for the return to the gold standard that is to say, return to have currency like the USD being backed by gold not a promise from the Trump administration and those that follow. Essentially paper money will go back to being a receipt that represents gold deposited somewhere. But hang on, why gold? Because it is precious. What is the intrinsic value of gold except that we agreed that it is beautiful to behold and it has value? Yes it has a few industrial uses but those uses are not enough to create a demand such as the one gold has. When you think about it, gold itself is a fiat. All you need to create money or a currency is for enough people to agree that it has value and they are willing to exchange it for goods and services. The problem is two fold. First, bitcoin right now is not being used for transactions much. Yes people say it makes transactions cheaper and decentralised away from the grip of governments and it’s true. However, the growth in bitcoin price has largely been driven by speculation not use. Demand is coming from anticipation of future appreciation in value and of course FOMO (fear of missing out). This should remind you of the charcoal iron. The charcoal iron might have been valuable but the speculative nature of the laws of supply and demand pushed its price to be far more than its worth. This is true of diamond as well (not just the Marange diamond). The stone has industrial uses but largely its value is driven by speculation. Some actually say it’s a completely controlled industry where supply is manipulatively kept low to keep the price up. It is a known fact that you can’t sell diamond jewelry at same price you bought it, you will get far less. Even if we say diamond has intrinsic value, this doesn’t mean there is no risk that people will be conned out of it or sold snake oil in the name of diamond as happened in Marange/Chiyadzwa. People went there in droves without investing in knowledge about how to identify a true gem stone and distinguish it from common stones that glitter. Bitcoin is being approached with as much ignorance as well. There are already some ponzi schemes built around bitcoin just like MMM. Gold is almost no different. It’s intrinsic value is an ascribed value. It was just an accepted medium of exchange. Yes bitcoin just like gold, diamond, the charcoal iron in 2011 is a zhet but that is not a bad thing. Think about the price of shares on stock exchanges. Sometimes they trade at above the total assert value of the companies and sometimes way below. Supply and demand can turn anything into a zhet even currency. The second problem is much more worrying for me as a person who has actually bought the cryptocurrency. Bitcoin is not so robust as a medium of exchange. Bitcoin’s processing speed (without going into the technical detail) is 7 transactions per second. Compoare with the VISA peak speed of 56 000 transactions per second. Let that sink in. This presents a problem. The reason why fiat currencies like the USD and all currencies really still hold value (they lose it over time though because governments and bankers print money in truck loads) is that they are accepted as a medium of exchange and transference of value. The Zim dollar tanked because it was losing acceptability in that function. If bitcoin is not as efficient as a medium of exchange then it may actually not survive. This is one of the reasons why some cryptocurrencies are spliting (they call them forks) from bitcoin. So, cryptocurrencies are probably here to stay but that doesn’t necessarily mean bitcoin will be the the one to stay. It is the most popular right now and has the most impressive price movement but this is largely fueled by speculation. Story is slightly different in Zimbabwe though because it is quite useful as a means of receiving money from relatives in the diaspora or for buying cars on Be Forward. Earlier I said there is much value in the blockchain technology and it can be built upon to create diverse and secure solutions. Another problem with the particular blockchain that powers bitcoin: it is not too friendly to developers. The code is too complex such that it will take developers too much time to build even the simplest of solutions on top of it. This is why the Etherium blockchain particularly is becoming very useful. It is structured in a way that makes it far easier for developers to build applications on it. The solutions that blockchain technology promises will probably be built on other blockchains which are not the particular bitcoin blockchain. I do not know yet what that will mean for the bitcoin currency itself. Why Then Do I Have Bitcoin? I am convinced of the usefulness of the blockchain technology and that cryptocurrencies will stay for at least a very long time. However, I am not sure if bitcoin will be one of those that survive. There are over 700 cryptocurrencies in the world right now and definitely not all of them are going to survive or reach broad usage. Zimbabwe’s dollar was once counted among world currencies but right now it is no more, it happens! To be honest, I am holding bitcoin for speculative reasons. I think there is still much growth in its value mostly fueled by speculation and the use cases that are applying right now. I want to gain from that gain as much as I can, it’s not a bad thing. Free markets are speculative markets: real estate, stock markets, currency markets, precious metal markets…. and the bitcoin market is particularly speculative right now. I am not a bitcoin expert, a cryptocurrency expert, a technology expert, an economist nor an investment expert, not even the sharpest pencil in the case. I am sure there are people with solid answers to some of the questions I have raised and I am happy to hear them. I do have a little bitcoin and no other crypto yet so I am really interested to know more. Please correct the wrong assumptions and help me increase my learning. I mostly wrote this article to distill my own thoughts and express my contradictions on the subject. I have decided to publish it so that we can have a conversation about this and to stimulate you (particularly you Zimbabweans) to think about why you have invested in bitcoin or you haven’t. Is it to speculate or to run away from speculation because you got burnt by a charcoal iron way back in 2011? I almost did. What If There Was Never Any $15 Billion To Start With? What The Heck Are Content Bundles For? Nice article, I just want to emphasize to people to try to understand what they are investing in. I believe people who profited the most from MMM understood that it was a ponzi scheme. Those who lost the most didn’t know better. Roughly, it costs you about $14k to buy a single bitcoin currently (equivalent to importing about 3 x s/h Jap vehicles). It’s worth taking the risk if you can afford a slack of $14k in your financial portfolio). However,, there are no guarantees that the bull run will continue or that there won’t be a surge in speculation or panic selling inevitably leading to a market crash. The word zheti is derived from criminal slang for “steal”. The miners seem to have the biggest advantage (for the less than 6 million bitcoins still to be mined, and with less than 20 years to do so!!). My question is what happens after all the coins have been mined? Is this world’s worth going to be “fighting to be squizzed” into or around 21m bitcoins? Yes there are no guarantees. I had not thought about the squeezing of value into that very finite number of coins. I think that’s the property people are most excited about that it will then mean the bitcoin will always rise in value unlike fiat but that is only if it gains widespread usage. Not too sure if it’s bitcoin that stays on or some other currency if any.